When it comes to pitching your services, knowing when to approach is vital. Understanding when CMOs are likely to move up and out of their roles gives your business the ability to approach precisely at the right time in order to win new business. 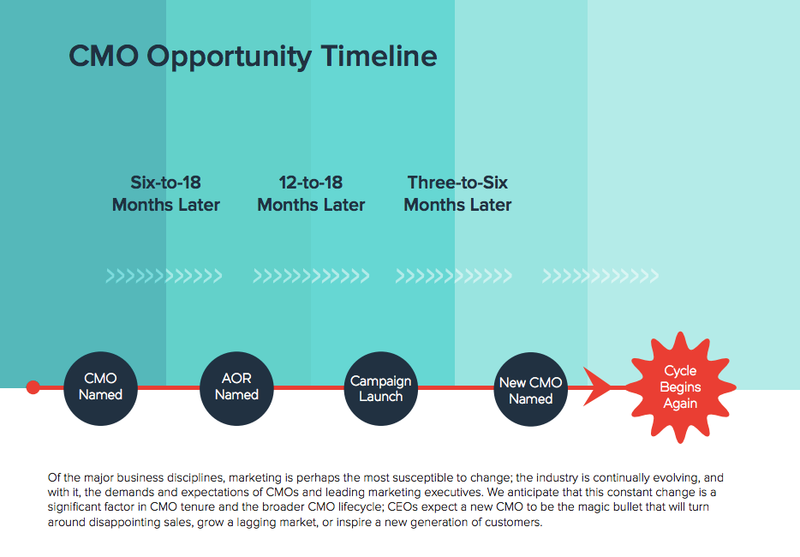 According to our CMO Tenure Report, the sweet spot for engaging with CMOs is within 3-12 months after beginning their role. During that time, media vendor shifts and agency reviews are expected to take place. Chief Marketing Officer Pepijn Janssens was brought on to the Amber Bev team. His previous work experience includes Global Commercial Director for Our/London Vodka at Pernod Ricard. Janssens has a rich background in brand management, strategy development PR and social media. Plans moving forward include a greater focus on international brands and prioritizing the growth of brand awareness. Agencies and martechs should be in touch throughout the year in order to influence these efforts across multiple channels. The ultimate goal is to triple revenue over the next four years to reach €1 billion, which will be allocated toward new product launches and increased marketing efforts. Sellers should reach out to leaders as soon as possible considering sales pick up in the summer, and an agency review is likely within the next 9-12 months. Pockit is experiencing leadership shifts and changes with the hiring of Head of Marketing and Communications Yaser Ayub at the beginning of 2019. Chief Financial Officer Pablo Uson also joined the team last September. Along with these additions to the team Pockit also lost CMO/CPO Arvind Desikan last summer. 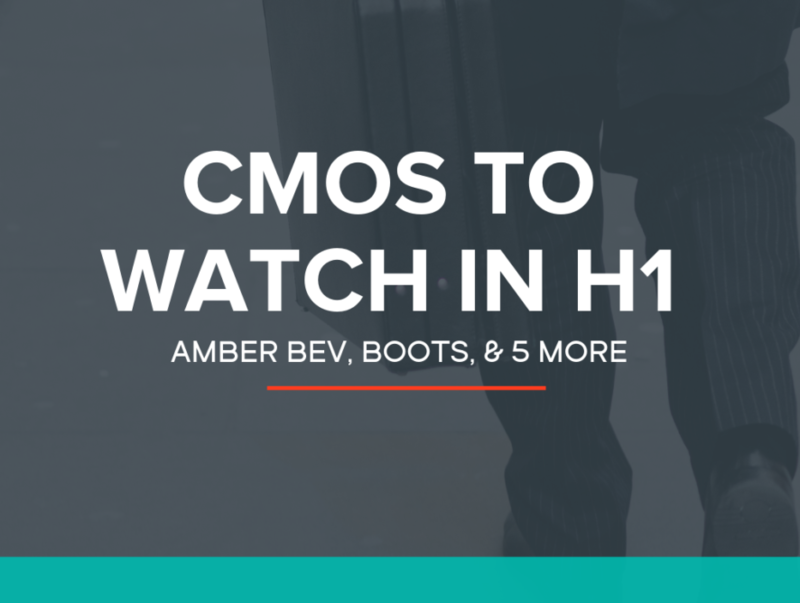 These changes are predicted to initiate agency reviews, particularly when a replacement CMO is named. Those in media, creative, digital and PR are encouraged to reach out for opportunities and as always we will keep you updated if we hear of any further shifts. According to Adbeat, digital display spend for Pockit totaled £1.4k with the majority of ads running programmatically. Sellers who can capture the attention of digital-savvy millennials are encouraged to reach out. Keep in mind Q1-2 and Q4 have traditionally been Pockit’s highest spending period for digital. The digital board game producer appointed Sofie Marien as marketing head in February. Past work experience includes a senior marketing executive role at Good Catch Games along with work with Sony Interactive Europe, Sitel and Juliet Media International. Since current company relationships are unknown, we suggest reaching out now to stay a step ahead of the competition. Those who have worked with gaming companies in the past will likely have an advantage. Sellers with high ROI should also reach out. Keep in mind, their target demographic consists of Gen-X, millennials, and Gen-Z so pitching omnichannel strategy is recommended. This month, raw dog food producer Bella & Duke appointed CMO Tushar Kaul. he previously worked at Campbells Prime Meat in the e-commerce/direct marketing head position. His career also includes experience with BIDs Scotland and Brightstart Scotland. In addition to this appointment, Digital Marketing and Advertising Consultant Stuart Bramley was hired in October 2018. Agency and martech readers are encouraged to reach out to the new hires. According to Adbeat, digital display spend over the last 24 months totaled £4.2k. Sellers with experience working with dog food brands will have an advantage. Keep in mind the target demographic consists of dog owners. Channels of use include TV, digital, outdoor and print are the heaviest focus and best way to secure revenue. Spending peaked in Q2 of last year, and of course around new product launches as well. Boots decided to reinvent it’s in-store experience and beauty offerings, so keep an eye out for the transformation launching in April. 25 of the beauty counter’s biggest beauty halls will be replaced with trending zones, discovery areas, and live demonstration spaces. In the coming 6 months, 20 new beauty brands and 805 products are expected to launch with more following towards the end of the year. Communication tactics will also change, with more of a focus on embracing differences. In order to execute this shift, Vineet Mehra was selected as global CMO, effective February. Other shifts include the addition of several lower-level marketing personnel to the digital and beauty teams specifically. These efforts are expected to boost revenue after recent declines. Boots plans to gradually increase spend, which typically spikes in H2. The revamp suggests a new target audience more focused on millennials and Gen-Z with a focus on females. We suggest reaching out for potential work in the midst of the brand revamp and Mehra’s hiring. Competition includes Burson-Marsteller handling PR duties, and Ogilvy and MediaCom as creative and media partners. In January, the global leader of agribusiness media and price reporting named Emma Luetchford as it’s Chief Marketing Officer. Other hires include Senior Marketing Executive Natalie Eastwood in February along with a promotion of Senior Marketing Executive Lauren Walsh. Clearly, the marketing team is expanding and agency and martechs are encouraged to reach out immediately to get involved in AgriBriefing’s rapid growth. Reviews are expected within 9-12 months. When pitching, sellers with experience in the agriculture industry will have an advantage. An omnichannel approach with an emphasis on digital is recommended, considering the company is focusing on expanding its international business. Target audiences include companies specializing in food production, crops, machinery, biotechnology and more. Owner of soccer centers and indoor soccer domes, Powerleague, appointed Simon Mills as Chief Marketing Officer in January. Previous work experience consists of marketing director at Jump In Trampoline Parks and experience with David Lloyd Leisure, Rippll, MRM Meteorite, and Rapier as well. The only known relationship is Newgate Communications who handles PR, so agencies and martechs are encouraged to get in touch as soon as possible. The team is growing and review is approaching, likely in 3-6 months. Adbeat reports digital display spend over the past 24 months totaled £1.8k with 98% of ads running programmatically in H1. Sellers are encouraged to focus on omnichannel approaches when pitching for future campaigns. After the closure of 13 locations across the UK and Ireland, the Powerleague’s bolstered C-suite will be open to establishing new relationships across the board.